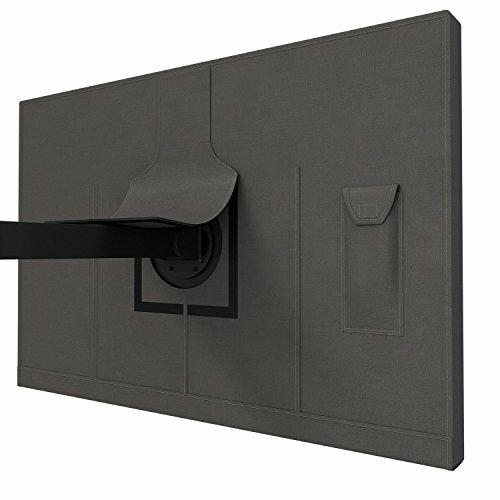 Protect your outdoor flat screen TV and keep it working and looking like new with the Duraviva Outdoor Flat Screen TV Weatherproof Cover. Our cover protects all sides of your television from dust, dirt, rain, snow, wind, and UV rays from harsh sunlight when outdoors. The cover even features an extra pocket on the back to store the TV remote control or other small TV accessories. Easily slips on and off you TV and can be installed even if the TV is mounted on the wall. All openings have Velcro flaps, making them easy to open and close. For 47-50 inch: Sleeve cover measures 46" in width and 28" in height. TV sizes within this range will fit. For 52-55 inch: Sleeve cover measures 52" in width and 30" in height. TV sizes within this range will fit. For 60 inch: Sleeve cover measures 56" in width and 32" in height. TV sizes within this range will fit. For 65 inch: Sleeve cover measures 60" in width and 35" in height. TV sizes within this range will fit. Our TV cover fits LED, LCD, and Plasma TVs from major brands such as LG, Samsung, Sony, Vizio, Philips, Panasonic, Sharp, Toshiba, and more. Our cover will also fit most kinds of wall mounts and stands. Complete Protection - Fully covers all sides of the TV, including the bottom. Even includes a back pocket to store your remote control. Strong and Durable - Made from top quality, lightweight 600D Oxford fabric with PVC coating to provide superior protection from rain, snow, dust, dirt, wind, and UV rays caused by sunlight. Easy to Install - Slides easily on or off television. Openings in back of cover allow cables or wall mounts to connect to the TV while the cover is on. All openings can be closed with easy-to-open Velcro flaps to prevent water or dust from getting in. High Compatibility - Fits all kinds of flat screen TVs from popular brands such as LG, Samsung, Sony, Vizio, Philips, Panasonic, Sharp, Toshiba, and more. NOTE: Please be sure to measure your TV first so that you can buy the correct sized cover. Duraviva uses cutting edge, high quality materials and design to keep your TV stylish and protected all year round. This product comes with a one-year limited warranty with easy customer service support. If you have any questions about this product by Duraviva, contact us by completing and submitting the form below. If you are looking for a specif part number, please include it with your message.